Finding a birding space between birthday cake and music is always a bit tricky, but I managed to force a gap in my diary for an hour or two at Marshside this afternoon. I’d probably have been better off staying home and eating even more cake. 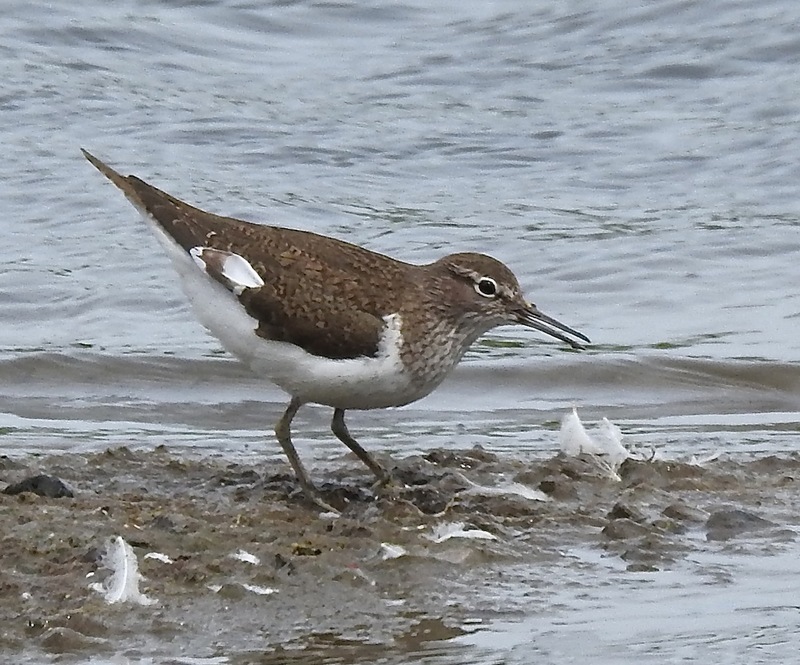 Pretty quiet, although a perky Common Sandpiper dropped in on the island off Sandgrounders and a few Mipits were mooching about. 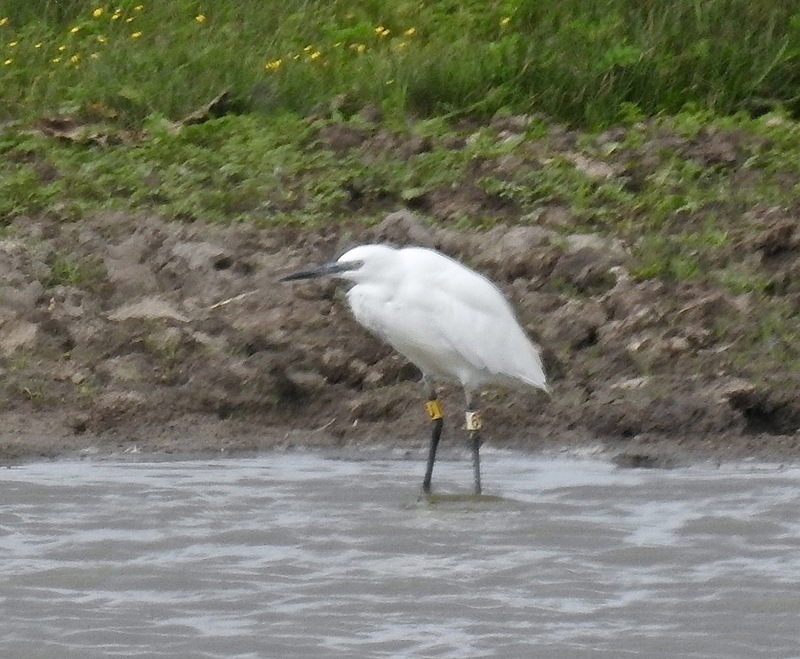 Six Avocets still at the back of M2 and young Willow Warblers calling in the hawthorns outside the hide. 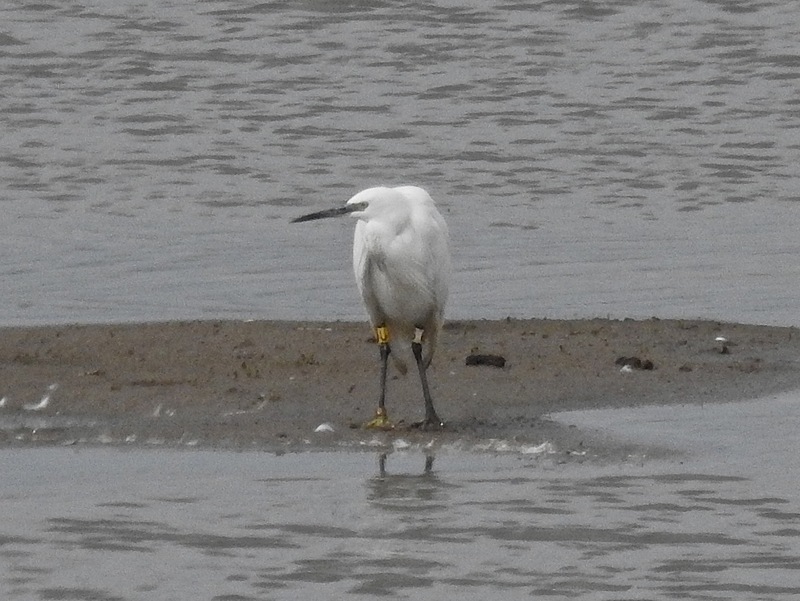 A Snipe dropped in from high, plummeting into the vegetation behind the grazing cattle, while down at Hesketh Road a colour ringed Little Egret was hanging out. Black “U” on orange on the right leg, number “6” on the left leg’s pink (?) ring. Anyone know where that one comes from? I’d check meself, but more cake beckons…. 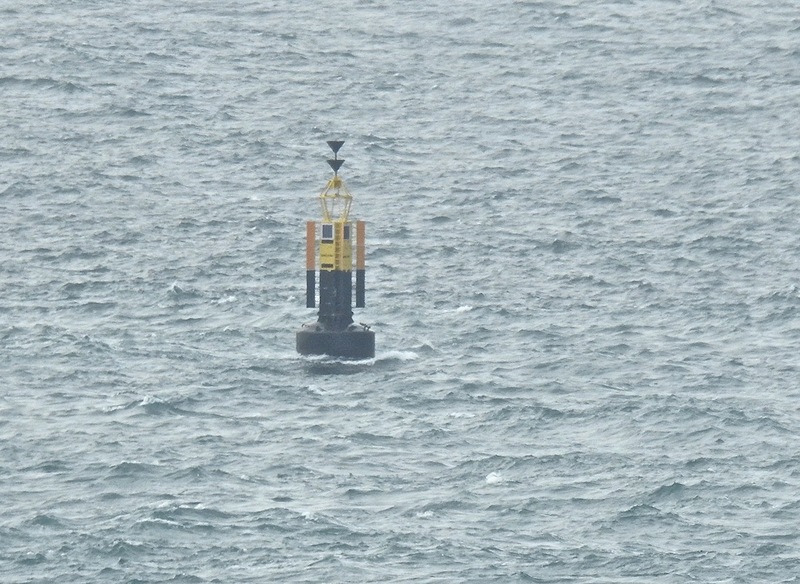 As points of reference go, the buoy marking the position of the treacherous Runnel Stone off Porthgwarra/Gwennap Head isn’t a bad one to lock your ‘scope on for a day or two of top drawer seawatching. With Neill at the wheel, and Jase Stannage, Bazzo and I stuffed into his Alfa as it stuck to the tarmac like a magnet for the long hours down into west Cornwall, we motored down on Wednesday night. 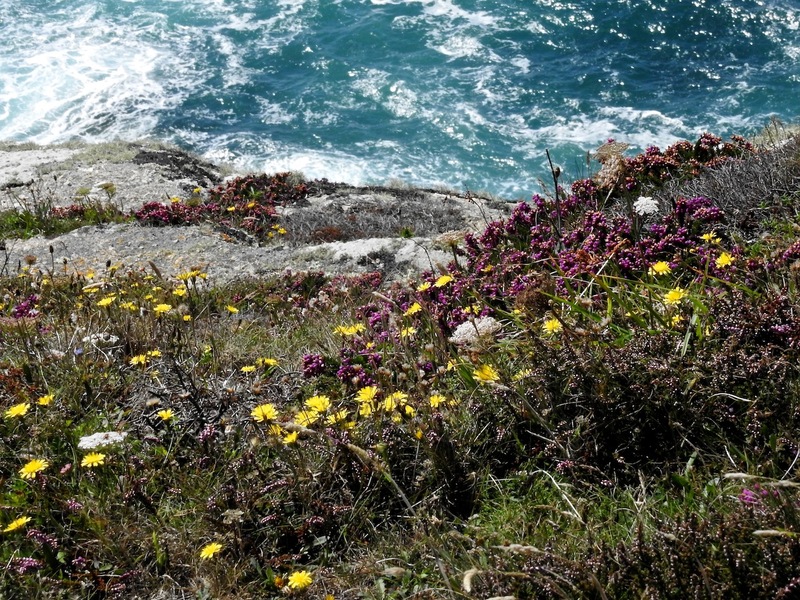 Finally familiar place names flashed by in the grey first light, on road signs engulfed in the lush vegetation of high summer hedgerows – Marazion, Mousehole, Lamorna, Rosketal…. 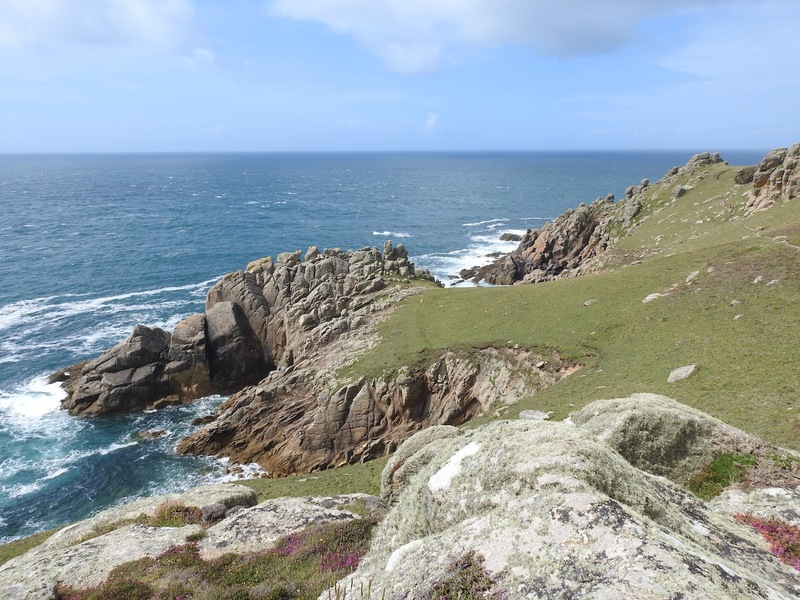 We struggled up onto Gwennap Head loaded down with chairs, brollies, scopes, cameras, scoff etc early on Thursday morning (I’m sure that hill has got steeper since I was last here) and scanned the waves from 0630 to 1345. A gentle westerly brought cloud and mist, before brightening later. 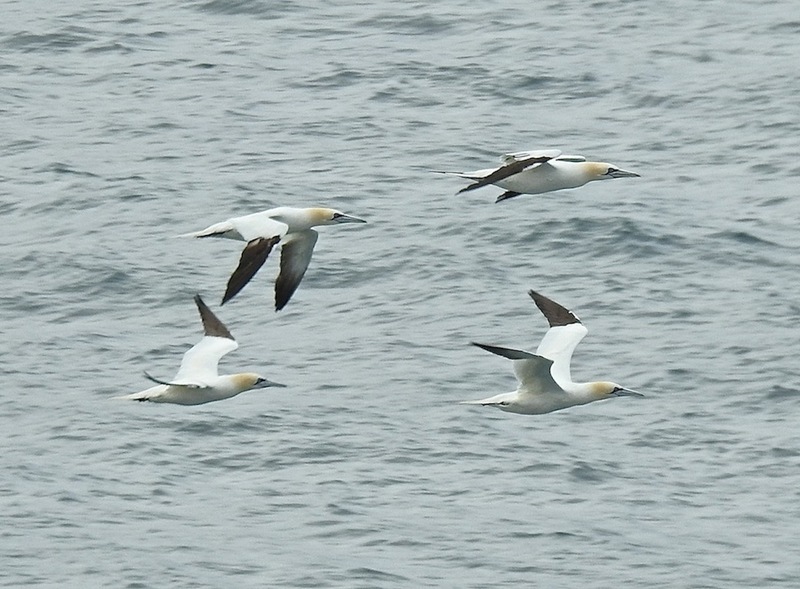 As ever, Cornwall did not disappoint, and a constant westerly procession of Manxies and Gannets, bore quality shear action cruising along with the local traffic. plus Chough (9), Shag, GBB, Herring Gull, Rock Pipit, Meadow Pipit, Stonechat, Bottle Nosed Dolphin (3), Harbour Porpoise (1), Common Dolphin (7). With the weather calming down and getting almost too nice we called it a day and headed back towards Penzance, carefully checking behind the settee and under the carpet at St Buryan to see if the Amur Falcon was still about – it wasn’t. Neill had booked us into the Lugger Inn, which certainly had more beer than we needed, but that didn’t stop us trying to test the fact beyond endurance, before we wobbled off into the tender embrace of a Thursday night in Penzance. What goes on tour stays on tour – but thanks to Dan Pointon for making sure we all got back to our pit in one piece. Friday morning was a bit, ahem, tricky after that, and remained so even after a restorative full English. 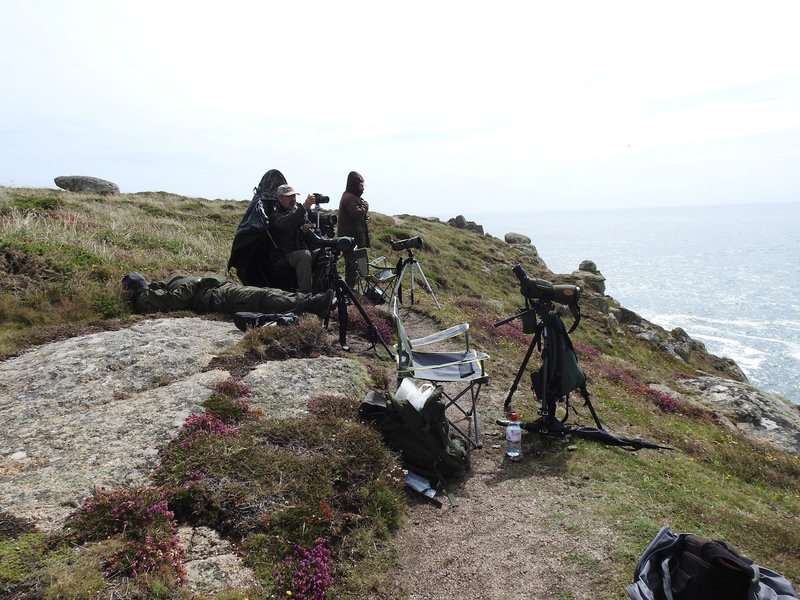 Still we got back up the cliffs and were settled with 15 or so other birders up on Gwennap Head for round two by 0845. Greyer today, with a stronger westerly and frequent rain. Conditions were promising and birds came in much closer, with more big shears and better views of them – and a stunning surprise Wilson’s Petrel, dancing, gliding and pattering over the waves. The star bird came past at 0910, heralded by the call “interesting petrel” coming from a birder just below me (thank you, thank you). 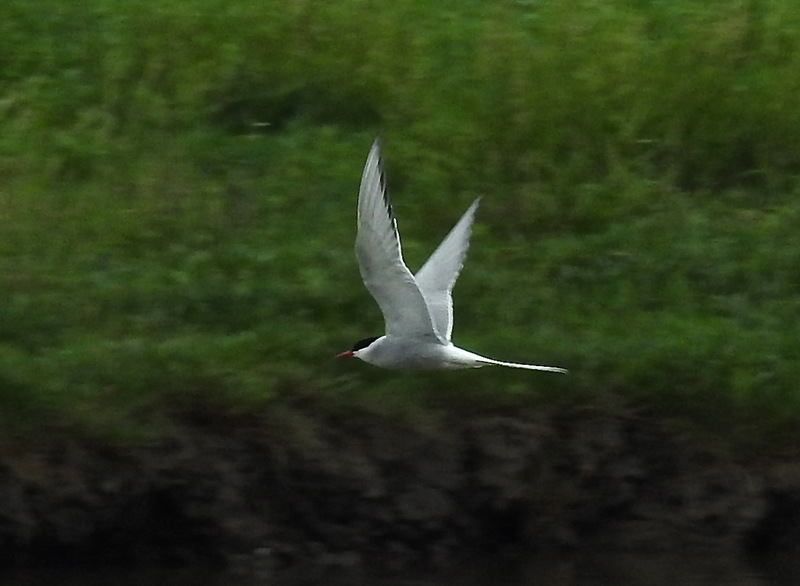 After a stressful few seconds I had it in my ‘scope – big white rump, straight back edge to the wing and square tail (although this was hard to see). It didn’t fly like a frantic Stormy, which always look to me like they are running late as they scuttle over the waves – “wind-blown Mars Bar wrapper” remains one of the best birding descriptions I have heard. At the same time the Wilson’s Petrel lacked the sharp, pointed wing shape of a Leach’s, appearing more compact. It danced along on dangling legs, pattering before stalling in the wind and sweeping into controlled glides low over the waves. Marvellous. 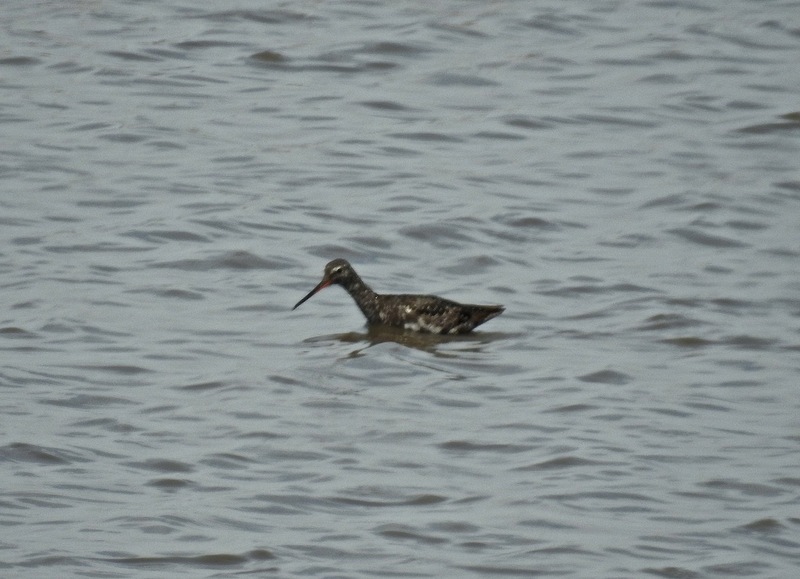 First one I have seen in British waters (happy, happy, happy). I lost the Wilson’s as it drifted off west behind the headland, one of many that are off the south west as part of a mini-invasion at the moment. 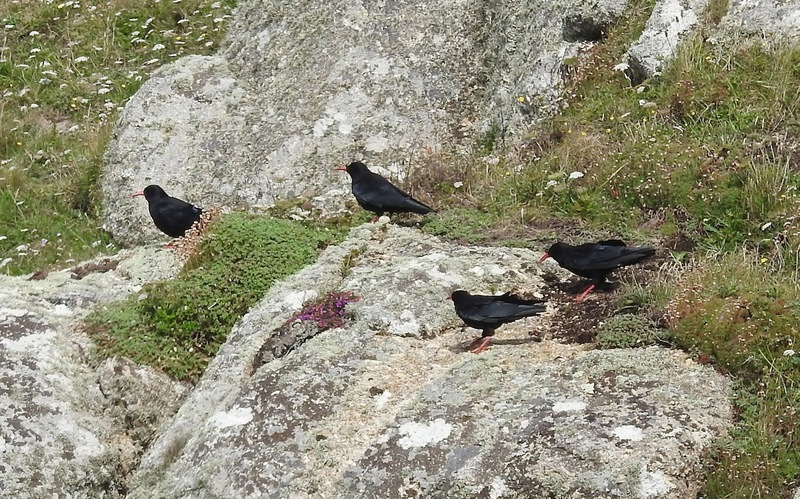 plus Chough (2), Shag, Herring Gull etc. Some of the Cory’s and Greats were reasonably close in, giving stunning views – the big Cory’s aimlessly wandering along, looking like they had no particular place to go, while any Great Shear close enough to clearly show plumage detail always prompts a big big smile. We pulled out to head back north just before midday, joining the rain-swept car park otherwise known as Britain’s motorway system to grind up the road with all the other lost souls in bumper-to-bumper tin cans. Despite a tremendous driving effort from Neill, it took about five years to get back to Merseyside. 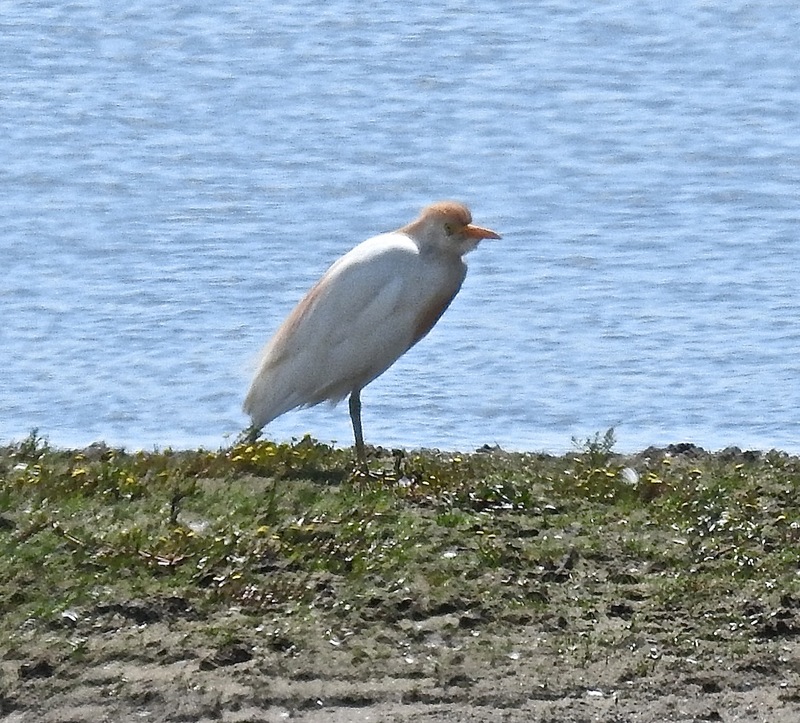 With Herculean effort the Cattle Egret grabbed at the air, rising above the Sandplant lagoon, then suddenly it got tired and dropped down onto the Junction Pool. It was a quiet, hot sunny day at Marshside, so what else was I gonna watch? I strolled down to the flaps and ‘scoped the beast for awhile. 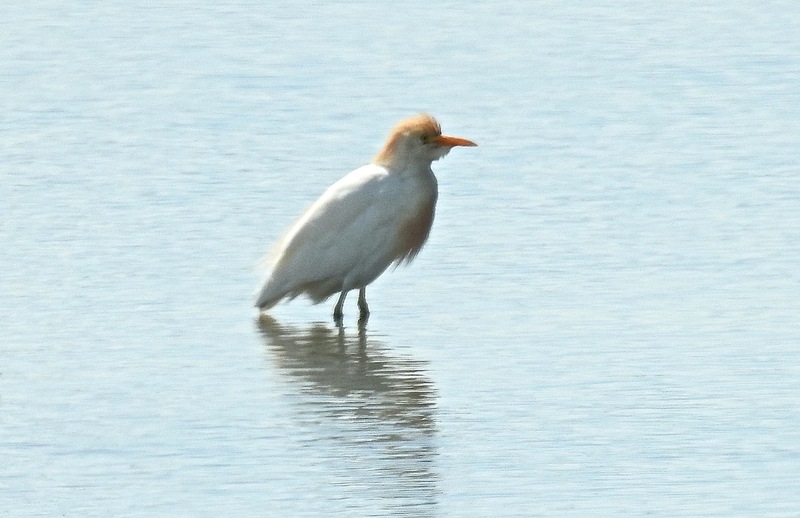 Commendably inactive in the heat, the egret sat motionless on one of the islands for 30 minutes before strolling into the water, where it sat for another 20 minutes, the wheels in its head moving even slower than those in mine. Then it strolled back to the island for more deep thought/inactivity. No fishing/water-snail hunting for me, no-sirree-Bob. After two hours of this high octane entertainment it flapped off a short distance into the long grass and coos and the lazy stand-off was over. 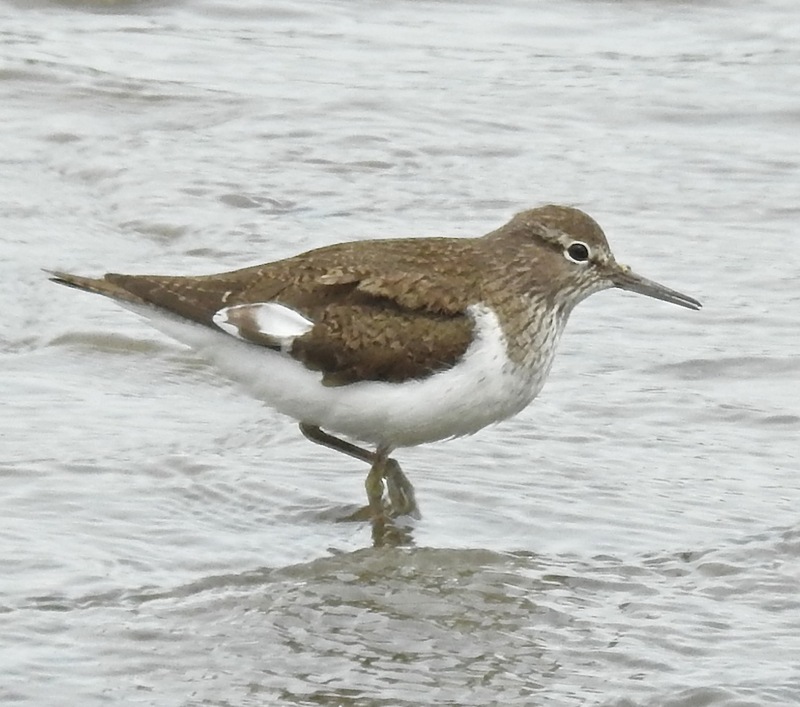 Earlier a check of Polly’s revealed a few Dunlin in with the Blackwits (approx 150 there) and a Brown Hawker, with two Ruff amongst the flocking young Lapwing on the Sandplant Pool. Three Buzzards and Peregrine overhead, but what’s left of the Sandplant was quiet, apart from Gatekeepers, Linnets and Goldfinches. Back at Dempsey Towers, Fly Agaric is starting to sprout up under the birches, so the exciting stuff can’t be too far away now. At precisely the second I finished mowing the grass, the rain started – it was almost as if Big Baby J was horticultural director at the towers, which is vaguely, if hypocritically, reassuring ‘cos I ain’t got a clue what I’m doing out there. Penetrating drizzle for most of the morning, but Reed and Willow Warblers still ferrying food to broods around the Hesketh Road platform, and a Grey Wagtail over. Golf course quiet-ish, or rather, busy with most of the Pringle Tribe inspired no doubt by The Open, to spoil a good walk. 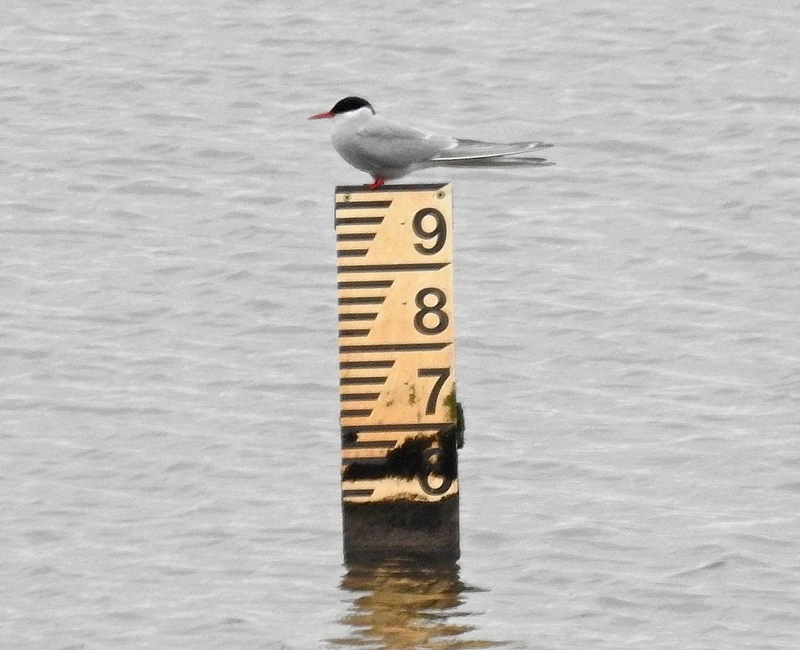 I left Marshside and popped up to HOM (this type of weather should have been good for a wader or two), where the adult Arctic Terns were occasionally displaying high above, drifting in slow, graceful formation circles, calling away. Occasionally they fell to earth. 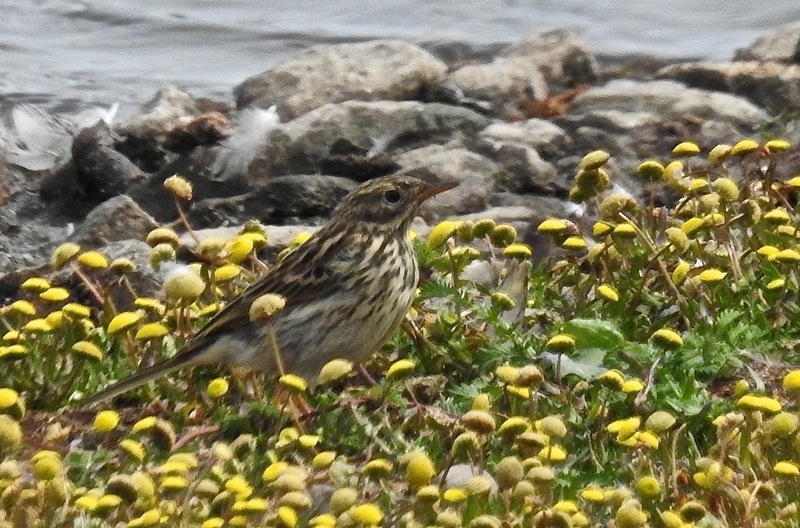 A few Dunlin, Curlew, Avocet, Oycs, Lapwing and Redshanks, with the Yellow Wagtails too. 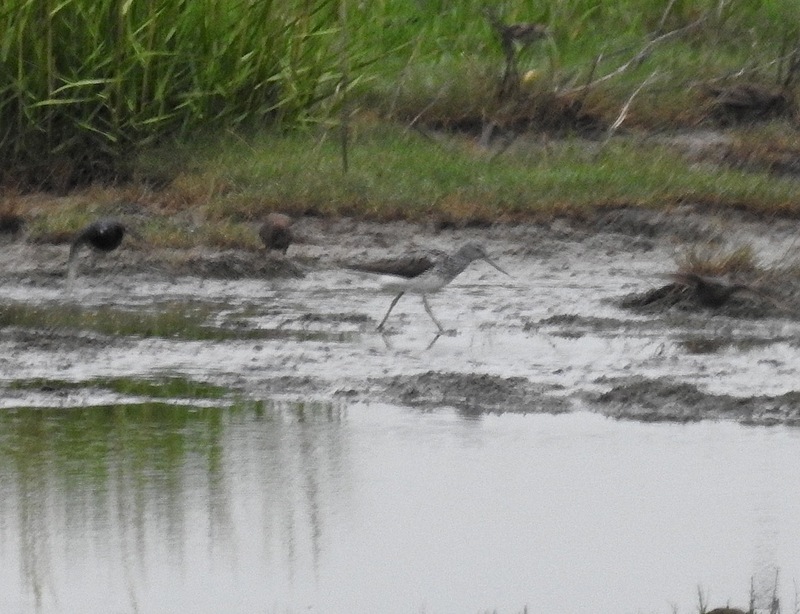 A Greenshank was calling and feeding in the rain just a bit too far away to try for a pic. 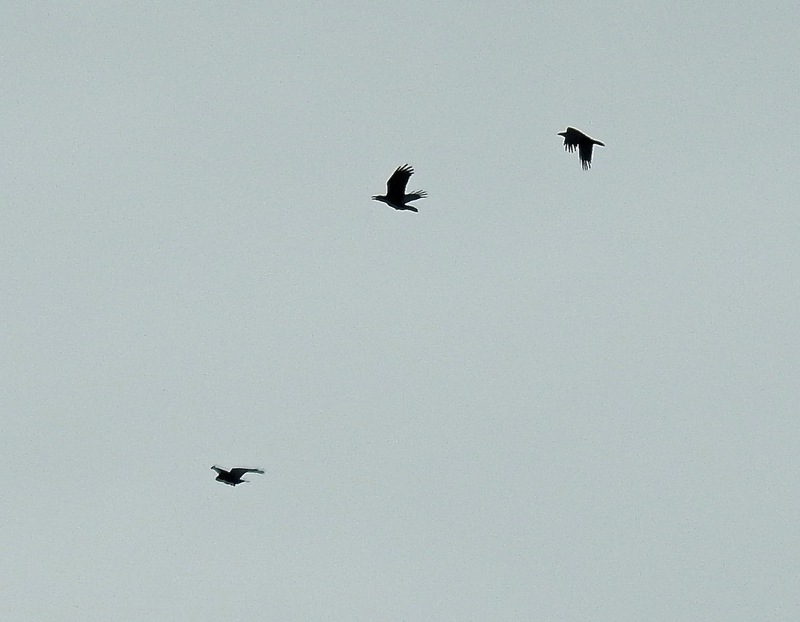 A young Peregrine spooked everything, tried for a Redshank and gave up to move away north, while three Ravens went cronking south. Ravens, Greenshank, Peregrine, Arctic Tern – Donald Watson or Nethersole-Thompson would have felt right at home. South of Ainsdale yesterday planning out a guided walk* when I heard a loud, high pitched “tik…tik..tik” call. It threw me for a moment or two, then I saw the sun bouncing off the undercrackers of a Grasshopper Warbler nearby – clearly I was too near its territory, so after a quick digi-bin (the eye cups are held on by Sellotape on my standard issue bins now, so the pics were inevitably ropier than usual) I moved on. 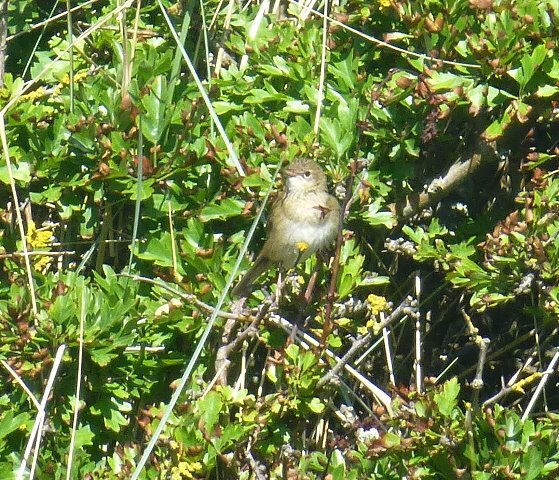 Dark Green Frits, Graylings and Dune Helleborines, and a family of Kestrels learning to hunt over the dune ridges. Good news for the falcons, bad news for the Sand Lizards. 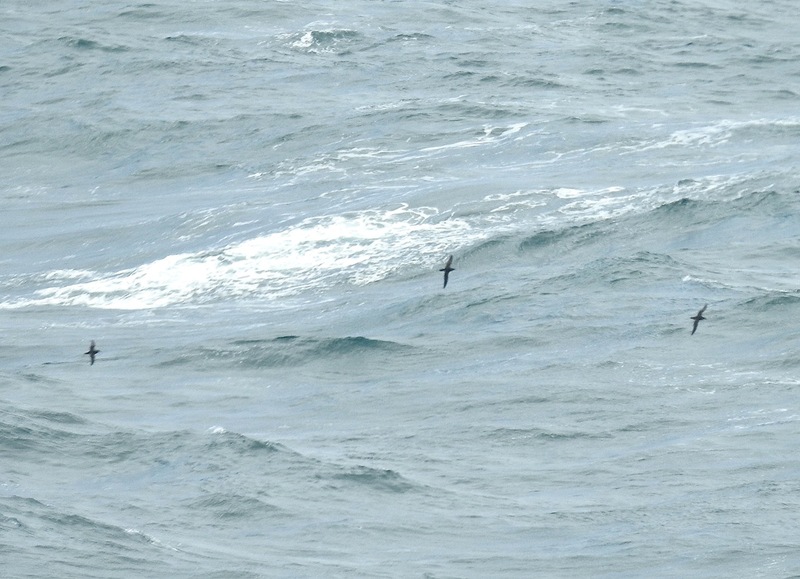 A lunchtime seawatch on Tuesday yielded 5 distant Manx Shearwaters, 7 Gannets, 80 odd Common Scoter (numbers picking up again now) and 15 Great Crested Grebes. 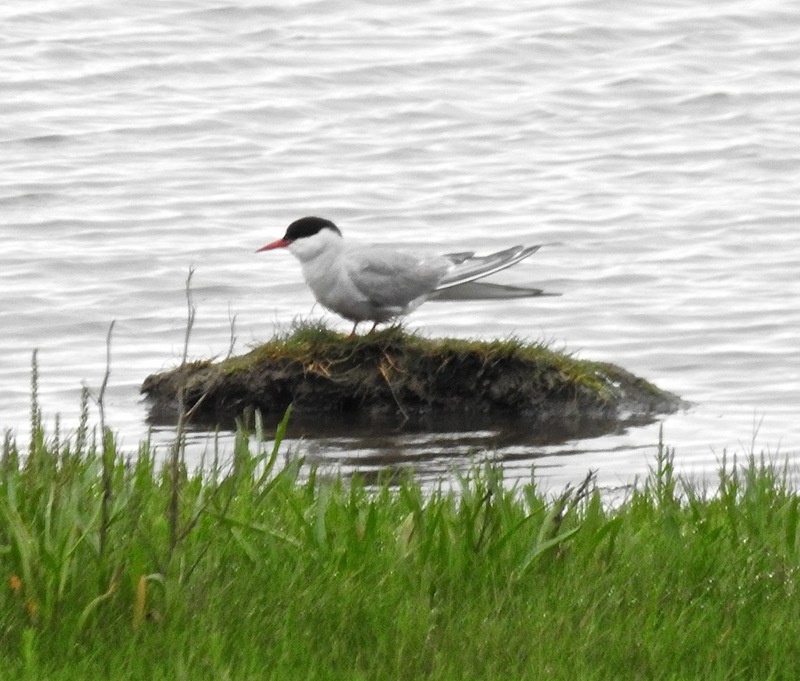 Plus the local tern traffic. 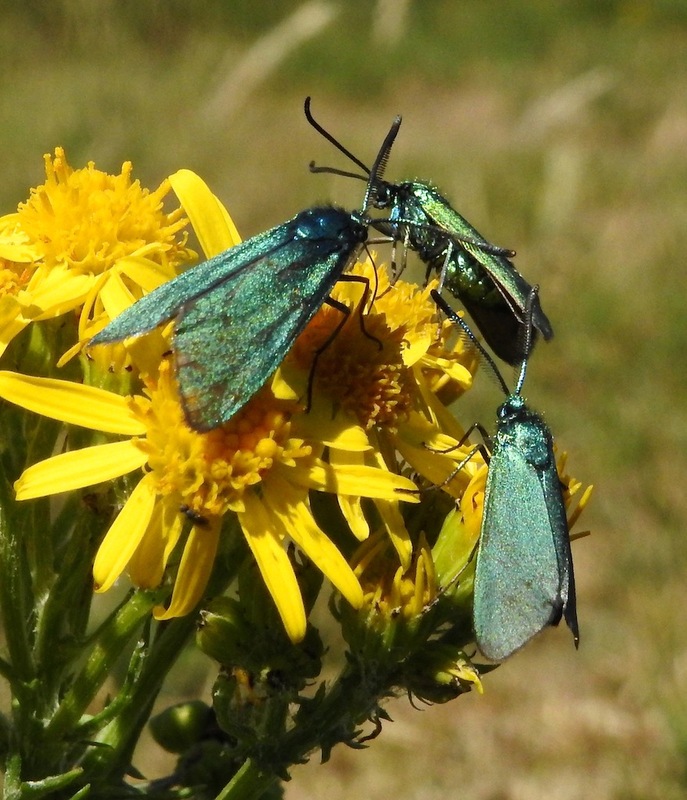 After arguably a little too much nectar in the Legless Arms last night, I headed down to Pinfold Meadow on Ainsdale NNR this morning to see how the insects were handling their liquor as they gorged on the last patches of blooming Ragwort. 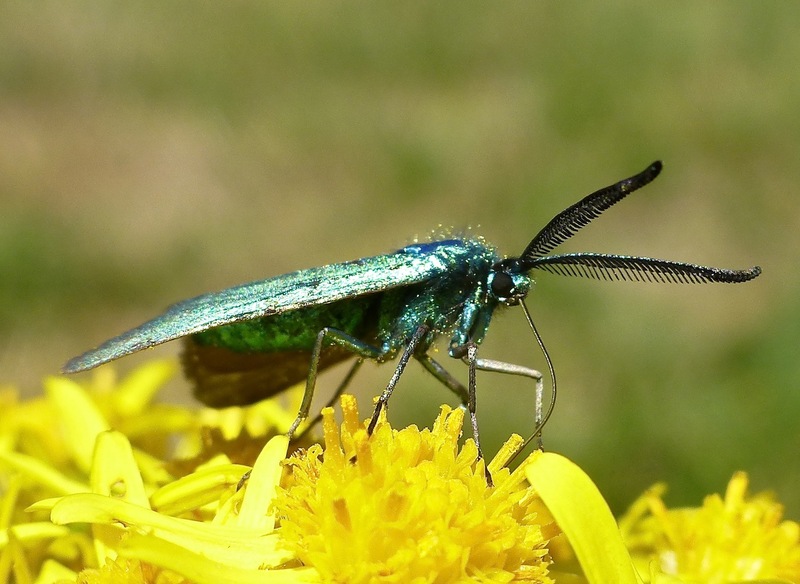 Plenty of Foresters in the northern section clambering all over the yellow flowerheads – glittering metallic beasts when the sun hits ’em. It gobbled ’em down, once it had shredded them with contempt for their fragile beauty. 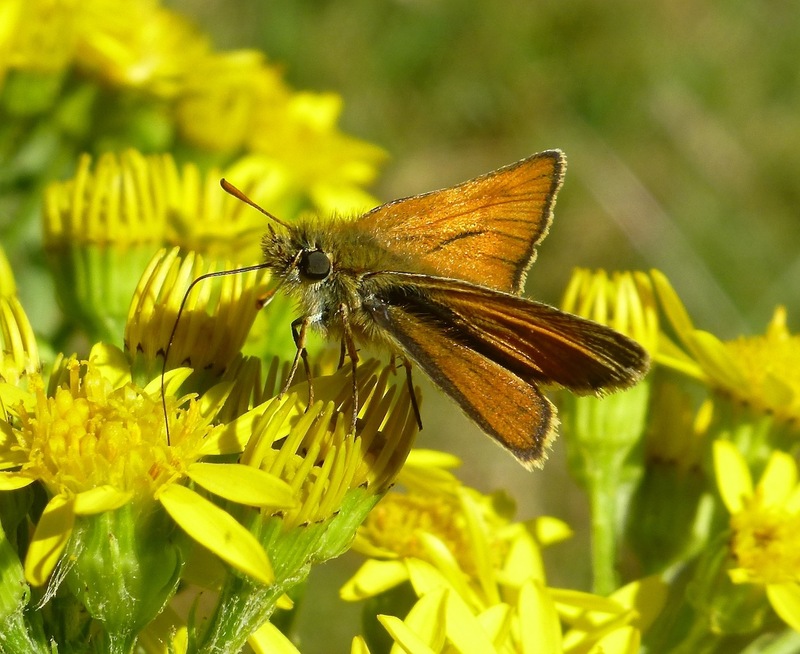 There maybe stacks of the skippers on the meadow, but they don’t deserve that fate. 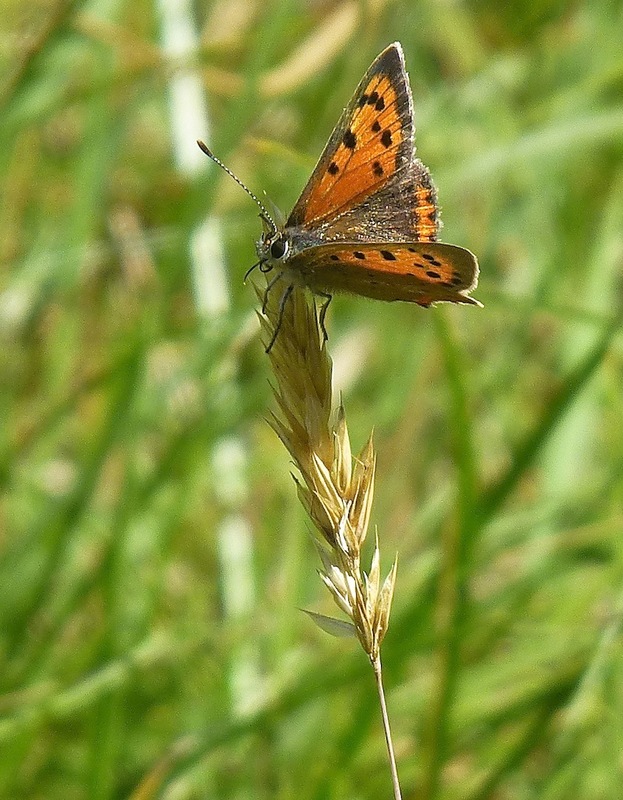 I strolled down to the firebreak and back, enjoying Dark Green Frits, Speckled Woods, Meadow Browns, Gatekeeper and Red Admirals, but I didn’t bump into any Ringlets today, although it was too sunny and hot an afternoon to be looking too hard. 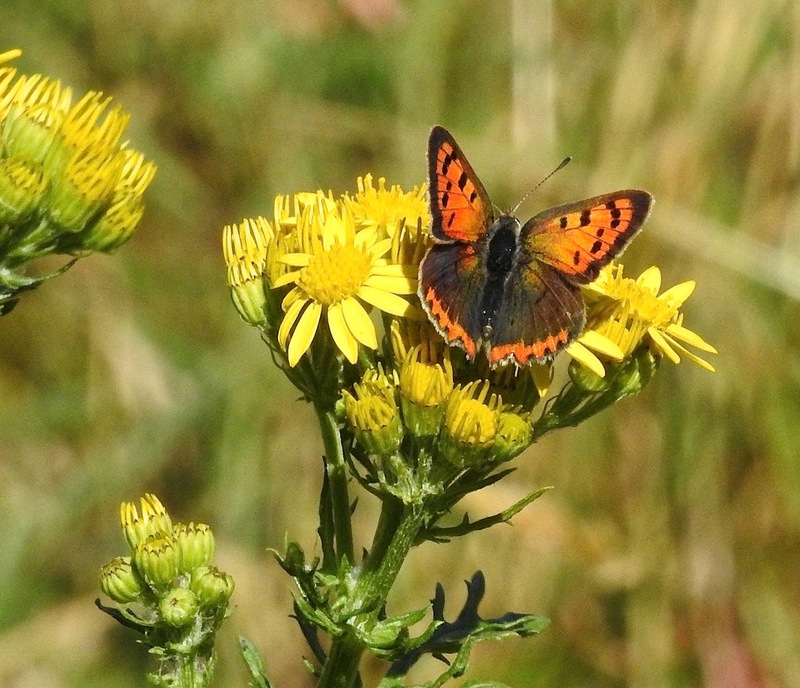 Back at the meadow a fair few Small Coppers were nectaring on the Ragwort too. 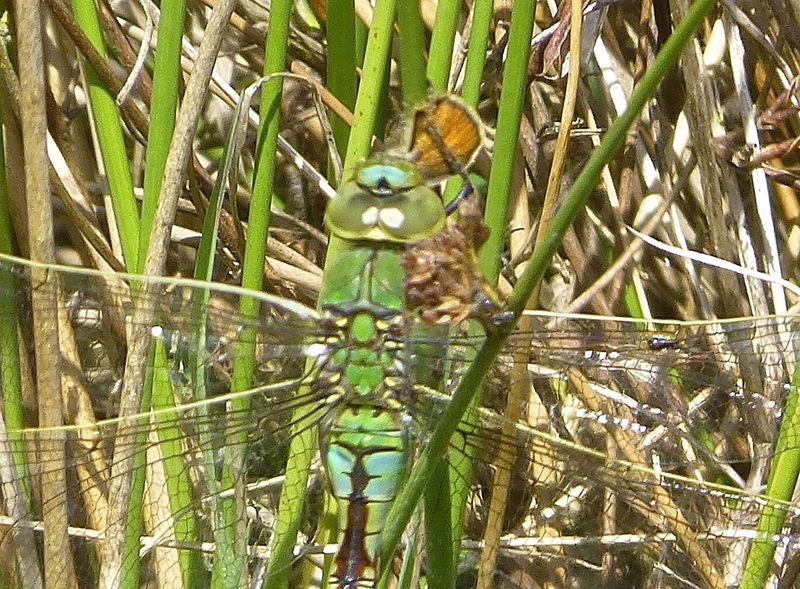 Good job the Emperor didn’t spot them – I may have needed counselling if I saw the brute tearing the wings off one of the Coppers. 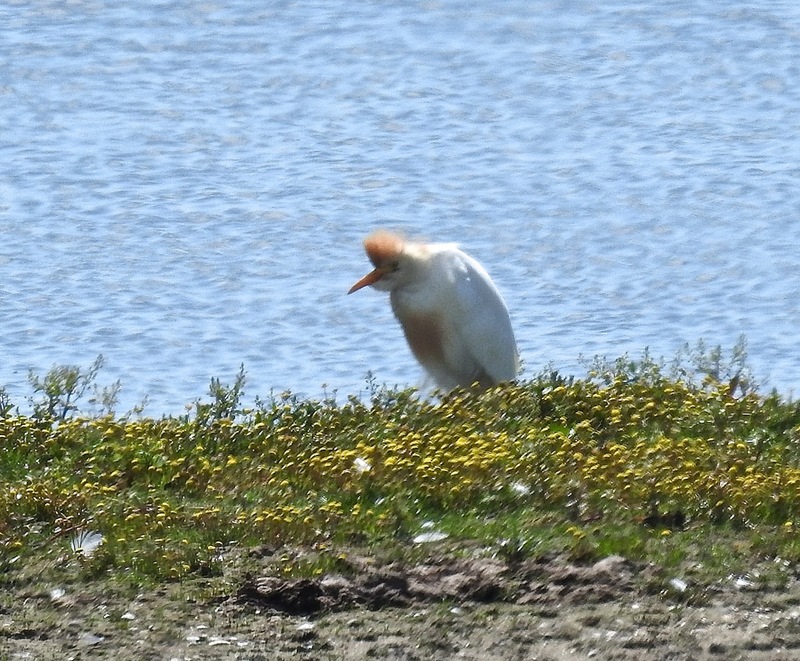 More hot, but the Spotted Redshank was still feeding away on Fairclough’s Pool at Marshside today from Hesketh Road, while two small roosts of Blackwits dozed and Lapwings got freaked by passing, well, everything. Yellow Wags up past Banks were a pleasure in the heat and a fine change from the insect deluge of high summer, but just when you sit back to enjoy the dusk, it goes crazy, all eyes turn to Porthgwarra and the i-phone goes bananas. Buzz…buzz…buzz…and the adrenalin kicks in, even though I’ve a few more shifts before I hit the tarmac. Why do the megas always have to be so far away???? A Hobby scorching through the blue above Dempsey Towers this morning was almost enough to pull me out of a sunny Sunday summer nosedive. Almost. 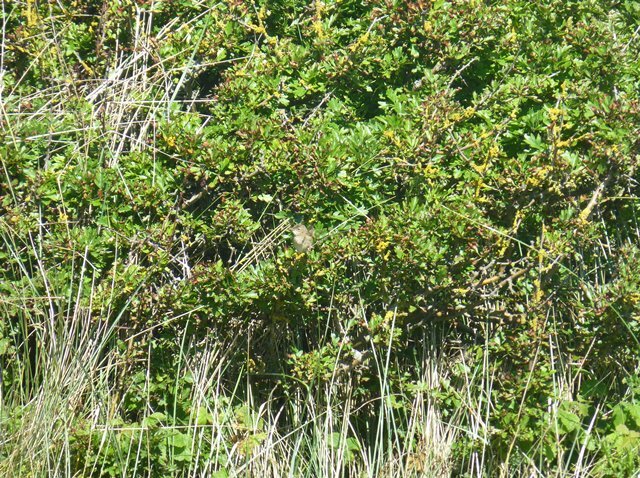 At least it was enough to get me down to Formby where I went for a wander down Range Lane to admire the new Ringlet colony Phil Smith discovered a week or so back (see comment on previous entry). 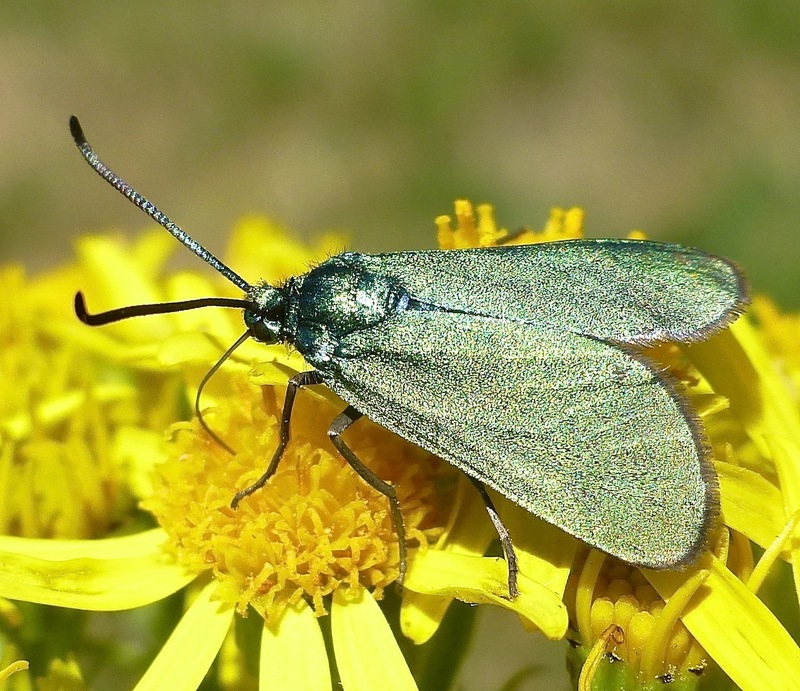 I’ve not heard of any from the firebreak at Ainsdale NNR yet this year (great discovery by Andy Spottiswood in 2016), and I wanted to say “howdy” again to the Sefton coast’s newest butterfly so off I went. 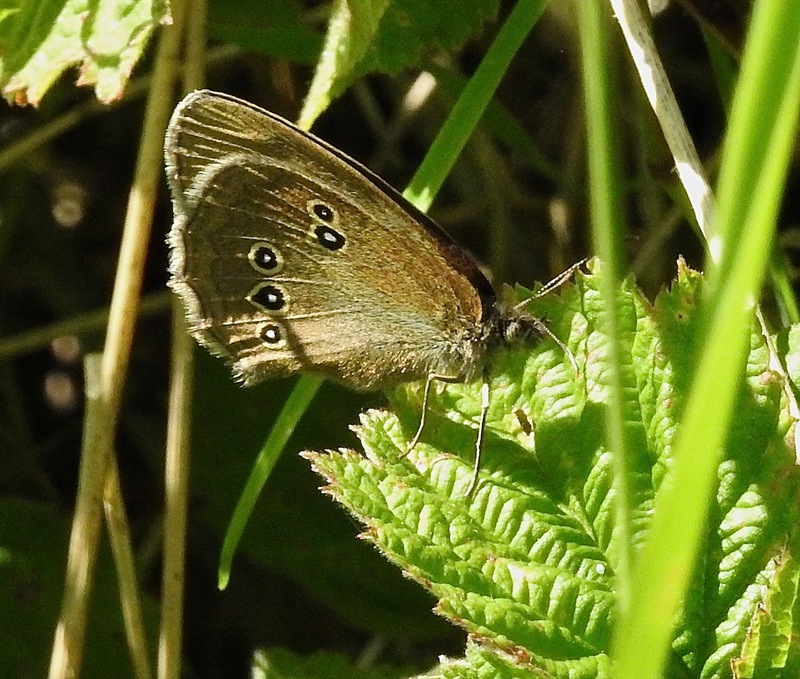 I counted at least nine Ringlets this afternoon – but what a bunch of sneaky varmints, tottering around the coarse grassland and brambles. 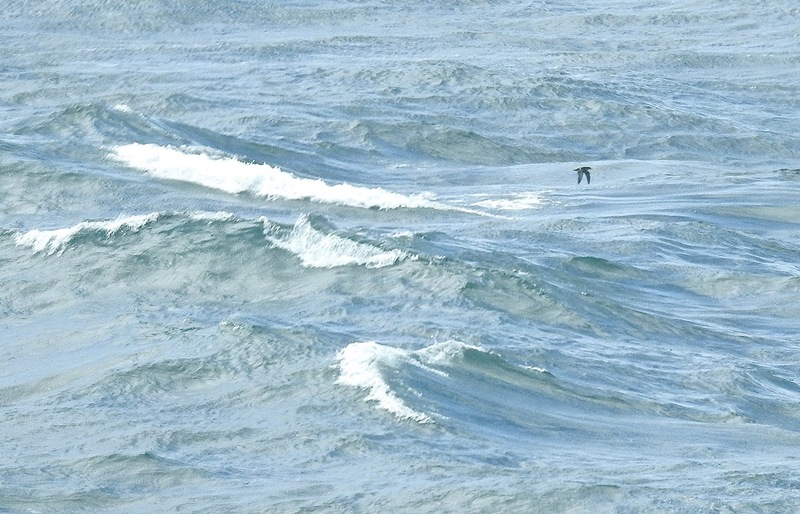 They rarely settled in the strong westerly breeze making it very difficult to get good views of them. Their aimless flight and smaller size made them easy to separate from the bigger, more deliberate Meadow Browns on the wing, but last year’s colony at Ainsdale NNR were much easier to get close to if memory serves. 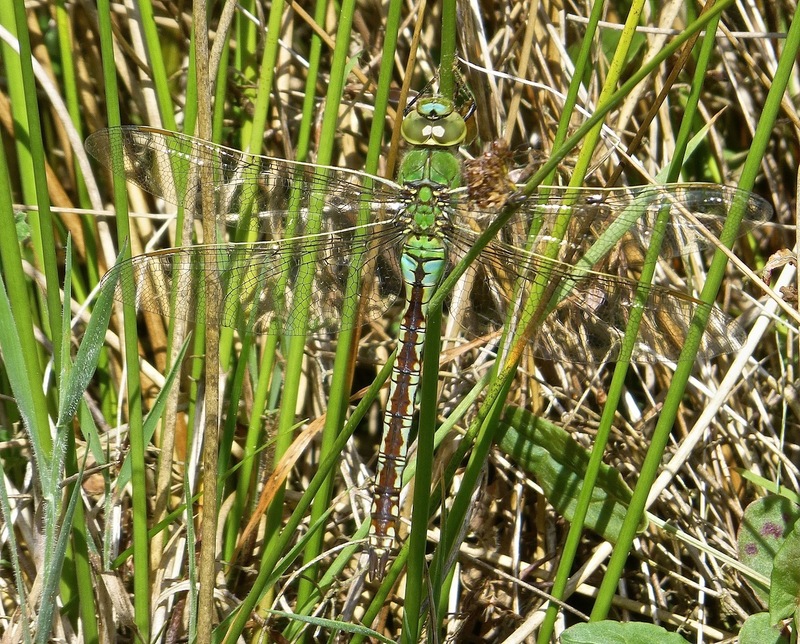 Crept up on one male and managed a few shots as it rested in the brambles and grasses, otherwise all my view were of the critters flying weakly about the grasses, usually just a few inches off the ground and hardly ever high above the rank vegetation. 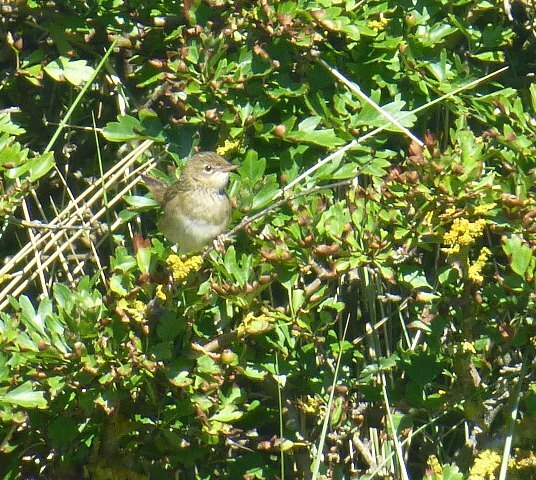 Plenty of Small Skipper and Meadow Browns, Blackcap, Chiffy and Whitethroat still singing and Common Buzzards overhead. Pyramidal Orchids flowering and centaury gearing up to be splendid.